A view from the bentside of the instrument. Franco-Flemish double-manual harpsichord, originally a 'transposing' harpsichord made in Antwerp in 1617 by an unknown maker. It was given a bass ravalement in Paris in 1750 by François Étienne Blanchet and it was later given a treble ravalement in 1786 by Jacques Barberini and Nicolas Hoffmann. 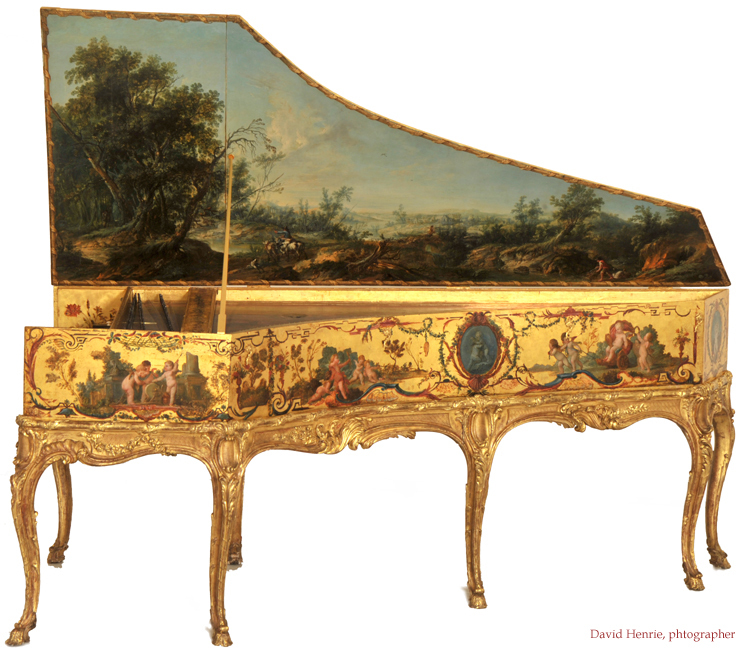 This image gives a good idea of the splendour of this harpsichord. The inside and the outside of the case are decorated on a ground of thick gold leaf with oil paintings on top of the gold, a process known in the eighteenth century as ‘vernis martin’. The inside of the lid is painted with a sylvan landscape with groups of figures engaged in rural activities. The author of this landscape painting has yet to be determined, but it exhibits many of the features of the best mid-eighteenth-century Parisian artists. The paintings on the cheek, bentside and tail with putti engaged in a 'Triumph of love' are also attributed to François Boucher. The outside of the case and the inside of the lid have now been cleaned and, once restored, should look particularly brilliant and beautiful. The stand is very fine and beautifully carved and gilded. Like the case of the instrument it has been widened on the cheek side to accommodate the compass extension of 1786 so that the curve of the actual instrument's bentside no longer matches the curve of the stand. This strongly suggests that the stand, in a high roccoco French style, is was made to appear to be contemporary with the outer-case decorations and paintings of 1750. The height of the stand is greater than normal and raises the instrument into a slightly higher playing position than normal. A possible reason for this is that it was made this high to accommodate the large skirts and dresses of the Mme de Pompadour, for whom it must have been commissioned. This page was last revised on 07 April 2019.